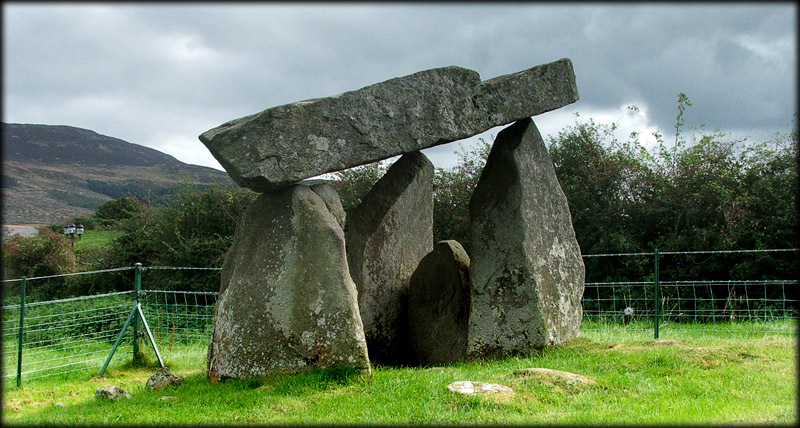 Situated in Ballykeel, Co Armagh is this wonderful example of a tripod dolmen. This capstone is the only one in Northern Ireland to be re-erected, both it and the door-slab were replaced during excavations in 1965. 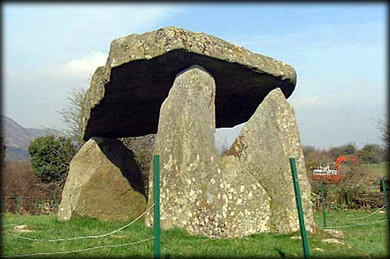 The capstone which is some 3 metres long has a notable notch in it, a feature of many other megaliths in Northern Ireland, see Legananny, the two large portal stones stand at around 2 metres high. The dolmen stands at the southern end of a 90 ft long cairn pictured below. There are two lines of stones running parallel with the cairn, at the Northern end of the cairn there was a burial cist which sadly is no longer visible. Situated: From Dundalk take the R177 North heading for Forkhill from here keep heading north for Camlough on the B134 after 3 1/2 kilometres take a left turn sign-posted Ballykeel dolmen, after approx 2 kilometres you will come to a right hand turn the dolmen is about 100 metres up this road on your right hand side. Discovery Map 36: H 9945 2134. Last visit Sept 2005.